Their NHL stock was falling. No one believed they could win another Stanley Cup. Then things changed. Mike Ilitch, the owner of Little Ceasar’s Pizza, purchased the Red Wings. Scotty Bowman became the coach. New, Russian players were drafted. All of this was the setup for one of the greatest comebacks in NHL history. This is the story The Russian Five tells. Not only do you get a fantastic telling of the fall and rise of the Detroit Red Wings, but you will also discover leadership lessons hidden in the movie. 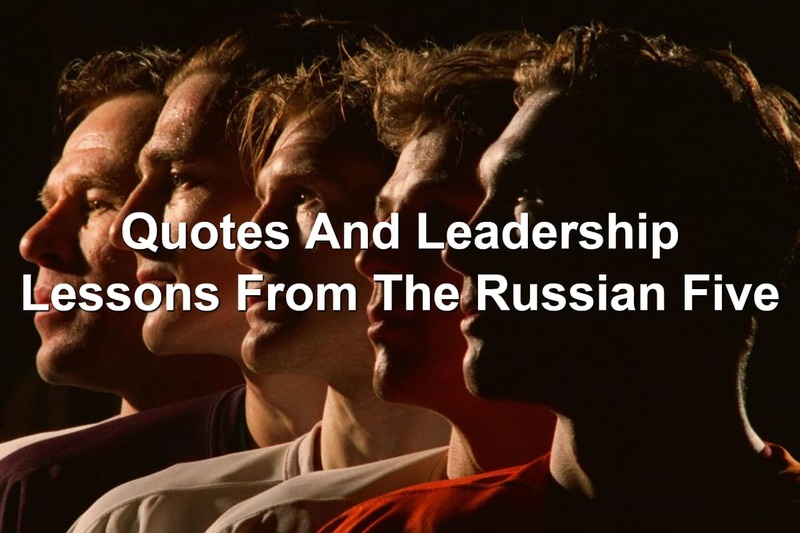 We’ll discuss these Reel Leadership lessons from The Russian Five in today’s article. All I was concerned about was how could I get good players on the Red Wings? This should be a concern for all leaders. Leaders need to be looking for the best talent they can find. Then find a way to bring those team players onto their team. We saw what a change good players could make in The Russian Five. By bringing in a group of Russian players (Sergei Fedorov, Viacheslav Fetisov, Vladimir Konstantinov, Vyacheslav Kozlov, and Igor Larionov), the Red Wings went from a laughing stock to a true powerhouse of an NHL team. The scouts for the Red Wings went to extreme measures to get these players. There were clandestine meetings. There were defections from Russia. And there were heartaches. Yet, this is what the Red Wings needed. What do you need to do to bring the right players onto your team? Who do you need to reach out to? What can you do to attract the best talent to your team? These are but a few things you can do to attract great talent to your team. There are other options you can offer as well. Find out what works and go after the top talent. At the time the Red Wings were recruiting the Russian Five, tensions between Russia and the United States were high. Citizens in the US were taught the Russians were evil, bad guys. You wouldn’t want to work or be around them. As the team began to seek out the Russian players, they discovered what they always knew was wrong. These Russians weren’t bad guys. In fact, they were a lot like them. We all hold preconceptions. Whether we judge people on the way they dress, the way they talk, or the way they look, we will prejudge others. This puts us into dangerous territory where we can miss out on great team members. Be cautious in judging others without getting to know them. Be willing to give someone you wouldn’t normally give a chance to. You might discover they will help take your organization to the next level. It was fun seeing Jeff Daniels of Dumb And Dumber play a part in The Russian Five. He’s a big part of Michigan history and he has a huge love of the Red Wings. He shared how many people in Michigan have a stronger than average work ethic. This comes from being the underdog. Many Michiganders go to college at Central Michigan or another state college. While many people see more value in going to Yale or Harvard. This creates a strong work ethic. They believe they have to work harder than people who went to a prestigious college. No matter where you went to school, you should have the work ethic Jeff Daniels talked about. You should be willing to outwork those around you. Put your nose to the grindstone and get the work done. This is how you shine and excel. The last time the Detroit Red Wings had won the Stanley Cup was 1955. It wasn’t until 1997 that they won another Stanley Cup. This is a drought of 42 years was painful and embarrassing for them. However, they never gave up. They continued to play hockey and shoot for the Cup. They knew at some point they would win again. Much like the Red Wings, leaders will have droughts. There will be seasons where things are going great. You’ll rack up wins. People will love you. Then things will change. You’ll feel like you can’t lead well. People will challenge you at every turn. Losses will mount. Don’t give up! This is just a leadership drought. Every leader has them. The great ones get through them. It takes a long time to build a great team. The Red Wings didn’t one day snap their fingers and had a great team. No, they had to slowly build their team. It took many years for the Red Wings to become the team that won the Stanley Cup. They had to find players. They had to build a great team culture. And they had to work on themselves. You may think you can buy a great team. You can assemble them and get everyone to work together. While this may be possible, it’s not common. More often than not, you have to play a long game. You have to take the time to build a great team. This may look like bringing on great team members. Or you might go the Moneyball route and bring on “mediocre” talent but when they all work together, you have one heck of a team. Look to play the long game. Work hard on building a team. But know a great team isn’t built overnight. Great teams are built over time. The Detroit Red Wings approached Sergei Fedorov to join their team. They offered him quite a bit to join. Yet something unexpected happened. Fedorov turned down the Red Wings offer for him to join their team. He wasn’t interested. You may think that being turned down by a talent you’re pursuing is a dead end. You may feel crushed or defeated. Don’t! Not everyone will want to join your team. Or maybe it’s not the right time for them to join, like it was for Fedorov. Be okay with someone saying “No” to you. It’s their choice. Your choice is whether to continue to pursue them or someone else. I have a wife and child. I cannot desert them. Konstantinov was another “No” for the Red Wings. His reasons for declining to join the team was different than Fedorov. Konstantinov’s reasons were personal. He wasn’t willing to leave his wife and child in Russia. He had made a vow to them. This made me have mad respect for Konstantinov. To see him turn down such an opportunity because of his family was stunning. He believed in the power of his family. You have to realize the power in your family as well. You made a commitment to love and cherish your wife. But are you living up to this vow? What Konstantinov can seem odd to many people today. People see marriages as something that can be easily broken. They believe their work or personal freedom is more important than their family. It’s not. Be more like Konstantinov. Love your family and look out for them. Fedorov eventually changed his mind and joined the Detroit Red Wings. His early time with the Red Wings was a bit tough. There was no one else like him on the team. This all changed when Konstantinov chose to join as well. With two Russians on the team, they formed a brotherhood. A connection was made. Sometimes it’s not about getting the right person on the team. Sometimes it is about getting the right people on the team. There are people who will click together and form an unstoppable team. I’ve had this experience. I have a great friend, Jeff, who, when we worked together, we were unstoppable in the I.T. department. Look at ways to bring the right people together. This may require you to ask team members who they would love to have on their team or see who they’ve worked well with in the past. Getting the right people together on your team will boost their performance and the success of the organization. Fedorov and Konstantinov eventually responded to monetary offers. The third Russian Red Wing responded to a different motivation. While money was still a factor, one thing that motivated Vyacheslav Kozlov to join the Red Wings was medical treatment. Kozlov was in a horrific car accident. It was a miracle he was still alive. Yet, he was. Kozlov had suffered massive head and facial injuries from his car accident. With the offer medical treatment, Kozlov chose to defect from Russia and come to the US. Here, he would receive the necessary medical treatment and an opportunity to play on the Detroit Red Wings team. Do you know what will attract and motivate the talent on your team? If you don’t, you owe it to yourself and them to discover what motivates people on your team. It will be different for every individual. It’ll be hard work to find out. However, when you do, you will see amazing things begin to happen. Scotty Bowman, the head coach for the Detroit Red Wings, believed you had to focus on the little things in your organization. By focusing on the little things, everything else would fall into place. His idea is simple but sound. When you look at the big things, all you can see are those things. The big things in your organization will take care of themselves. Not because you’re focusing on them, but because it is hard to miss the big things. It’s the little things that often get passed over. And these little things will destroy a great organization because it’s easy to miss them. What are the small, overlooked things in your organization that gets overlooked? When’s the last time you looked to see what’s been missed? Begin to look for the little things in your organization that needs your focus. Look for ways to bring these things to the attention of those on your team. Then begin to work on them. Steve Yzerman spent his entire NFL career playing for the Detroit Red Wings. He was a major driving force and a beloved member of the team. On October 7, 1986, Yzerman became the Red Wings team captain. However, he suffered an injury after the Fedorov joined the team. This opened up the possibility of Fedorov stepping up into a leadership role. Fedorov did. He accepted the call to leadership and filled the void left while Yzerman was out injured. You might think you are the only one who can fill the leadership role within your organization. You are the leader, after all. 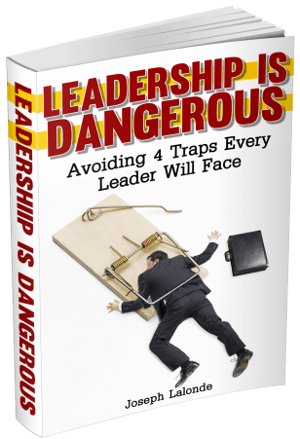 But you’d be making a serious mistake to think there aren’t other leaders within your organization. There are. And they’re waiting for the chance to step up. Don’t hold people back because there’s no room for another leader. There are plenty of leaders looking to step up. Offer them the opportunity. Many people were concerned about the Red Wings recruiting Viacheslav Fetisov. Fetisov was an older Russian player whose best days may have been behind him. The Red Wings still wanted to give him a chance. It’s a good thing he did. When they brought him onto the team, the other Russian players respected him despite his age. They knew the ability he brought to the team and rallied around him. Leadership positions can be given to the young and the old. It’s not about the age of the leader. It is about the ability of the leader. Don’t be afraid to give someone old or young the opportunity to lead. If they have the ability, give them the opportunity. There were many people who doubted whether or not the Red Wings could win another Stanley Cup. This doubt came back to the leaders of the Red Wings. Their ability to lead was called into question. People believed the leadership may not have the best strategy. They may not be able to inspire or bring together the team. The questions were valid. They were also wrong. In the end, the Red Wings leadership proved they would be able to bring home another Stanley Cup. They, in fact, had even more success in the future by winning multiple Stanley Cups. Don’t be afraid to have someone question your ability to lead. Their questioning could be from their lack of faith, their lack of knowing you, or from some other unknown reason. There’s nothing you can do about their questions. All you can do is work hard and show them you mean business. During one of their seasons leading up to their Stanley Cup win, the Red Wings mounted many losses. Looking in from the outside, things didn’t look good. Yet there was something brewing within the Red Wings. Their eyes weren’t on the individual battles. The Red Wings were looking at the big prize. They had their eye on the Stanley Cup. The losses hurt, sure. They were failures, yes. They were also stepping stones to getting to the Stanley Cup. Each loss moved them a step closer to the chance to regain the Cup. They saw the losses/failures as necessary to get where they wanted. Leaders have to be okay with failure. Each failure should be seen as a learning opportunity. You can break down each failure to learn what not to do next time. Be okay with failure. Failure will be the thing that pushes you closer to your end goal. The Red Wings leadership had originally predicted they could have a Stanley Cup win within 8 years. This prediction was off. Way off. It took the Red Wings 15 years to finally win the Stanley Cup once they began a process to win it. They had to beat back the frustration of their prediction being wrong and instead focus on what they desired: The win. Have you made predictions or plans in your organization only to miss deadlines and see failure? Take heart, sometimes our predictions are off. We don’t know the course success will take. You have to be willing to stay the course. To follow the plan set out. Work the plan until the end. Question: Have you seen The Russian Five? If you have, what leadership lessons did you take away from the movie? If you haven’t seen the movie, what Reel Leadership lessons from The Russian Five that I shared resonated with you? Let me know in the comments below.